The garden is wrapping up and one of the last harvests of the year is pumpkins! I originally grew pumpkins for both decorations and jack o' lanterns but sadly most didn't grow large enough for carving. (thanks to the deer that snacked on my garden, ugh!) I planted Connecticut field pumpkins. They are an heirloom variety that can be used for cooking but can still get quite large. I wanted to grow this variety for it's versatility. I was hopeful that one pack of seeds would provide me with both baking and Halloween pumpkins plus some large ones to use for chicken feed. Hopefully next year! For this season though, I ended up with lots of small to medium sized pumpkins. I was pretty excited to make pumpkin puree from my own pumpkins. I've made pumpkin puree before, but it was from a store bought pumpkin labeled 'pie pumpkins'. With the dozens of pumpkin varieties out there I somehow thought those would be different, better...sweeter. The good news is, they're not! My pumpkin puree turned out exactly the same as when I use a specific 'pie pumpkin'. Cut the pumpkin in half. I like to leave the stem on while I cut so I can hold onto it better. 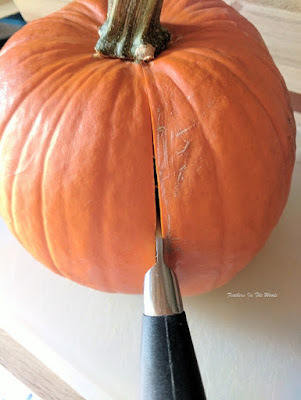 Once cut, pop the stem out and turn the halves on their side. Scrape out the insides with a spoon removing the pulp and seeds. Save the seeds for roasting. The pulp can be tossed to the chickens or in the compost pile. Make sure to get as much of the stringy part out as possible. Line a baking sheet with parchment paper and place pumpkins on it cut side down. Make sure the baking sheet has a lip on it since the pumpkins will seep a bit as they cook. Allow to cool then peel off the pumpkin skin. Place the pumpkin flesh in either a bowl or your food processor. I used a hand mixer but it is much quicker to use a food processor. Using a hand mixer on low, mix for 1 minute then increase the speed. Continue increasing the mixer speed every minute until the pumpkin is the consistency of applesauce. Or just toss it in the food processor and hit puree. Once pureed, pour pumpkin into a strainer and place over a bowl to drain. I let mine drain about 1/2 hour. If you skip this step you're pumpkin might be a little watery. Depending what you're doing with it, that might not be a problem. Can be stored in the refrigerator for up to a week. For long term storage, freeze in 1 cup portions. I use Ziploc bags, but small reusable freezer containers work just as well. A few tips: Attempting to flip the pumpkin halves by using forks is not recommended. Not saying that's how pumpkin got on my ceiling or anything....just noting that once cooked the pumpkin halves look solid but they're really quite mushy and flimsy! A spatula works best for this. A medium sized pumpkin made 4, 1 cup portions of pumpkin. This might not taste exactly how your used to canned pumpkin puree tasting. However, most canned pumpkin puree is actually a special winter squash variety that are sweeter and darker colored. Once frozen, pumpkin puree will last about a year so you have plenty of time to transform it into something yummy. I kinda have a thing for pumpkin treats and my Never fail pumpkin cheesecake recipe is the most viewed recipe I've ever written! Another popular one is my Homemade pumpkin caramels. If you've never tried pumpkin caramels you should definitely make them. They're pretty easy as far as candy recipes go! Speaking pf pumpkin candy, I have a recipe to make! Have agreat week and happy baking! Ha ha ha. I can certainly understand that! I get organic canned pumpkin puree but think I will make my own puree for pancakes soup w Cinnamon they make it in a restaurant near me they said start with onion celery and carrots vegi broth I would imagine pumkin pie spice and Pumpkin puree and put cinnamon on top recipes are calling for garlic? I don't think so ? And heavy cream I would use low fat half and half instead worked in restaurants all my life and could jump the line? So no garlic! And pumpkin pie spice has clove ginger cardomen Mc Cormick makes the spice a lil goes a long way! I love your website! All of your posts you share are wonderful! This was so descriptive and easy to follow I had to share it. I love fall, especially for all the pumpkin recipes and know I know how to puree my own easier! Thanks! When I puree our pumpkin, we also roast the seeds with a little salt. My kids say that's the best part! Pumpkin puree is great to have on hand. Thanks for the step by step instructions. Canned puree is never quite as good! I agree...fresh pumpkin puree really is better than canned!